Have you got a special event coming up? Why not put in an order for a special cake to help the celebration? 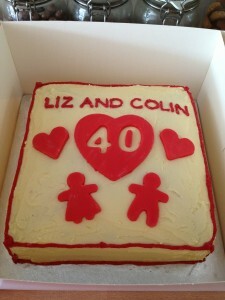 We do a range of layer cakes and cupcakes, as well as wedding cakes and christening cakes. Our standard size round layer cake is 8 inches and prices start at £20 for a victoria sponge filled with jam and buttercream, and includes a personalised message if wanted. As standard, our cakes are finished with buttercream in the middle and on the top (except for the rainbow cake, which comes fully covered as standard) but they can be done with a full buttercream covering, just let us know when ordering that this is wanted. If you would like a cake covered in fondant that isn’t a problem either, this does increase the cost. We also take requests, so if there is anything specific you are looking for then please just ask. We also do fruit cakes (very popular at Christmas), which come finished with a layer of marzipan and then either fondant or royal icing, and decoration. They can be round or square. An 8 inch fruit cake is £30, 10 inch is £40, 12 inch is £50. If cupcakes are what you’re after then look no further. A box of 6 cupcakes starts at just £10 and flavours include all those listed above for the layer cakes. Decoration can be chosen from a wide selection. Personalisation of cupcakes includes a 50p charge per cake. Can’t deicide between a cake or cupcakes? Why not order a giant cupcake, prices starting at £40.00. 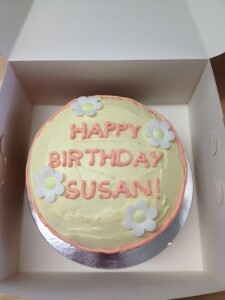 All cakes and cupcakes can be made as gluten-free with no extra charge. We can also do dairy free cakes. Cakes and cupcakes can be made for the same day but must be ordered by 10.30am with collection after 4pm, and an extra charge will be added in these circumstances. 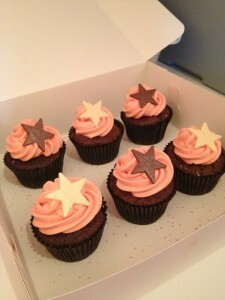 We can also deliver cakes/cupcakes, but a delivery charge does apply depending on distance. If you would like to know more or would like to order a cake, you can email kate.ae.appleby@gmail.com, phone 0191 2854052, or pop into the shop for a chat! The team at Delicious Decadence loves weddings, that is what most of the gossip in the kitchen is about! The other thing we love is cake, which is why we absolutely adore wedding cakes! Not only that but we know how important your special day is and we only want to add to it. Every cake we make is unique and personal. We guarantee a competitive and fair price for whatever cake you desire. We therefore invite you to contact us either by phone (0191 2854052), email (kate.ae.appleby@gmail.com), or come into the shop for a chat. We also do Christening cakes, if this is something you are looking for please do not hesitate to get in touch (see above for details). For more images check out our Facebook Page, and Instagram feed, where we post frequently! Hi, I am just after 10 cupcakes for my son’s christening. We have a cake so they are just for the children. 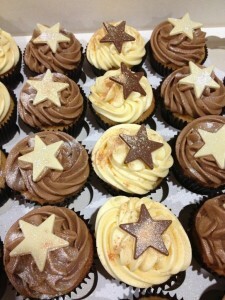 Just maybe plain or lemon sponge with a light blue icing and then maybe a cream star like the stars in your pics? Would we be able to collect on Friday and what would the cost be? Many thanks. Hi how much would you charge for a two tier cake. An 8″ bottom and a 6″ top. It’s for a christning. I look forward to your reply.